composting is gaining more and more popularity and it is in a lot of countries quite easy to get hold of a batch compost worms from a reputable breeder. Countries like the United States, England, Germany, South Africa and Australia to name just a few have a lot of well established worm farming businesses but there are still many countries in the world where there is not a single worm business on the map yet. Worm composting is a great way to recycle organic (wet) waste materials like kitchen scraps, pet poop and garden clippings with the help of earthworms. Of the thousands of kinds of earthworms that are living on our planet only a few varieties of worms love to feed on rich organic matter and convert it into worm castings one of the worlds most balanced natural plant foods and soil conditioners. A big compost worm "Eisenia fetida"
If you want to start a worm business you need to get yourself some breeding stock that you can multiply. Earthworms can be found on all continents except Antarctica. But as mentioned before only a few kinds of earthworms are commercially usable and can be kept in captivity. Worms come in many shapes colors and sizes. 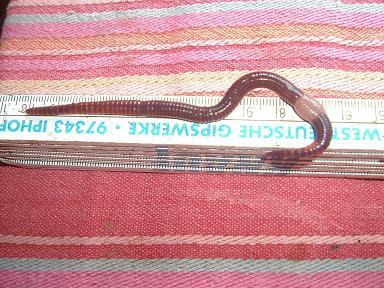 Have a look at our page "Earthworm types" for an overview. Lets focus on the worms that I mentioned above. Eisenia fetida as well sometimes spelled Eisenia foetida is probably the worm that is used by most worm composting businesses and worm farming enthusiasts at home. It loves rich organic matter, multiplies rapidly and is in general a very hardy little creature. If you want to get hold of some have a look at well established compost heaps or anywhere else where you might find decomposing organic matter like garden centers, nurseries or landfill sites. If these worms are living in your country there is a very good chance that you will find a herd of them sooner rather than later. Once you got your worms place them in some shredded moist newspaper in a bin or bucket and follow follow the instructions on the pages "Starting a worm farm" , "Homemade worm bin" and "Worm business"
Lumbricus rubellus is related to Lumbricus terrestris is an excellent worm to start a worm business and can usually be found in rich organic soils, manures and other animal feces. . They are native to Europe and Great Britain but can now be found on all continents except Antarctica. The worms are the largest native worms in from Europe and can grow between 25 to even 50 cm in length. They are not ideal for worm farming as they are not eating as much organic matter as for example Eisenia fetida and are multiplying slowly. The night crawlers can be easily found at nights on lawns or moist forest grounds as they come often out of their burrows to move overland and if possible mate as well. If you want to breed them you can simple place them in an enclosed area in your garden of any choice. Use some boards or bricks make sure that they reach at least 10 cm / 4 inches into the ground and the walls above should have a similar height. Lumbricus terrestris doesn't climb over barriers, travels only above ground and can easily contained. They make excellent bait worms for freshwater fishing. So take your torch and pick up a good amount of night crawlers offer them as bait worms and you took your first step to start your worm business. This is an excellent worm for worm composting, it grows bigger than its cousin Eisenia fetida which makes it very attractive for fishermen, consumes large volumes of organic waste materials and multiplies quickly. It originated in Europe but can now be found all over the world except Antartica. Like Eisenia fetida and Lumbricus rubellus the worm can usually be found in compost heaps and animal feces. Once you got a batch of worms follow the instructions on our page "How to start a worm farm" and read many helpful articles that you can find on our site map. A worm business is a sustainable business idea, can be started on a very low budget and brings many other benefits. Read more at "How to start a profitable worm business on a shoestring budget". The African night crawler is an excellent composting worm that originates from West Africa but is now widely spread throughout the warmer regions of the United States. It is a prolific breeder and loves warm temperatures between 24 - 30 degrees "C" / 75 - 86 degrees "F". It is however very vulnerable to cold weather. The colors of the worms are grey to purple. It can be found in warmer regions in compost heaps. Before you get your worms find out how to start a worm farm and if you want some on hand information on how to grow and multiply your worms and turn them into an income spinner have a look at the page worm business. Go from the page "start a worm business" to the page "Worm tea"
Return from "start a worm business" to the "Home Page"